Made from fir stair treads and baseboards salvaged from a vacant farm house west of Dysart. 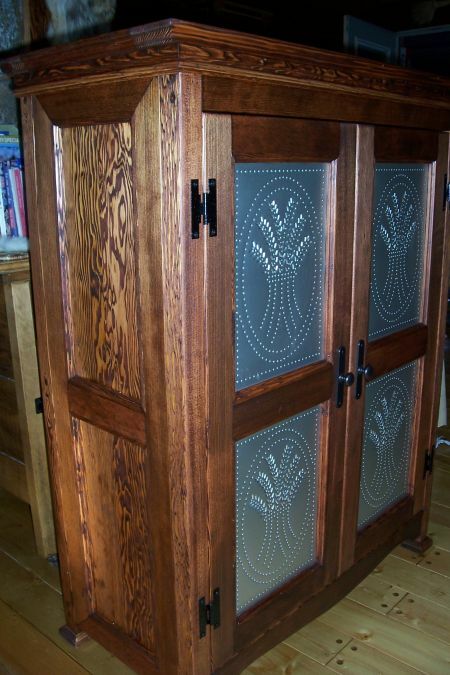 This piece of furniture was fashioned after the Pie Safes that were common in the 1920's and 1930's. The punched tin fronts allowed air circulation while not allowing insects to get at the food stored inside. These were used to keep foods fresh prior to the advent of refrigeration. The tins have a wheat sheaf motif. Three interior shelves. This chair was retrieved from an old farm dumpsite. It originally had been upholstered with springs and horse hair that was in very bad shape. The chair was disassembled, upholstery removed and rotten wood replaced. 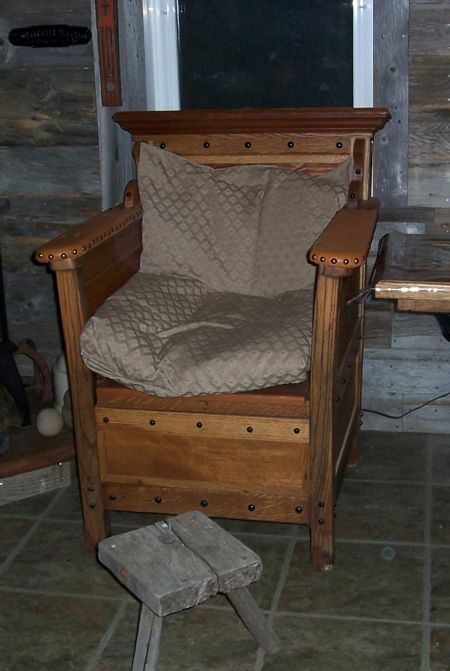 I rebuilt this chair in hall chair style with a hinged seat that lifts for storage. Arms are leather covered. The wood is salvaged oak, fir and maple. I believe that this chair dates back to the 1920's or 1930's. 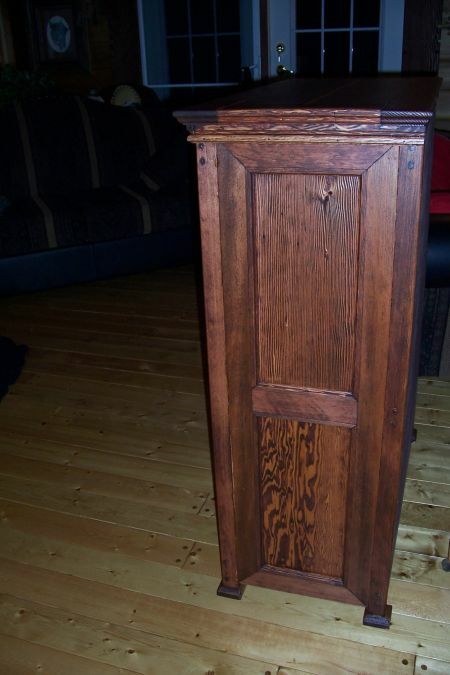 Built from fir baseboards and the rails and stiles from a fir door that were salvaged from a 1930's Catholic rectory. The oak table top insert is from an old oak table. Trimmed with oak, maple and birch from an old sleigh runner. The door knobs and back plates were salvaged from a closet door from a 1920's farm home. 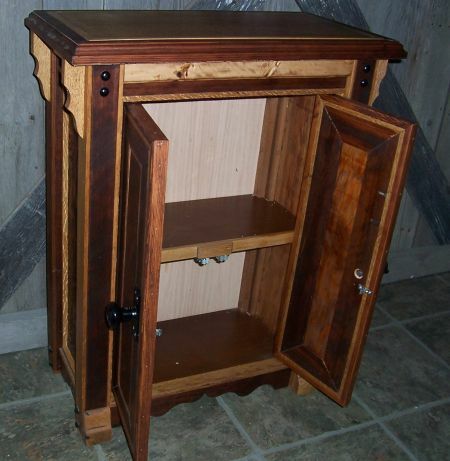 The cabinet has two inside shelves. 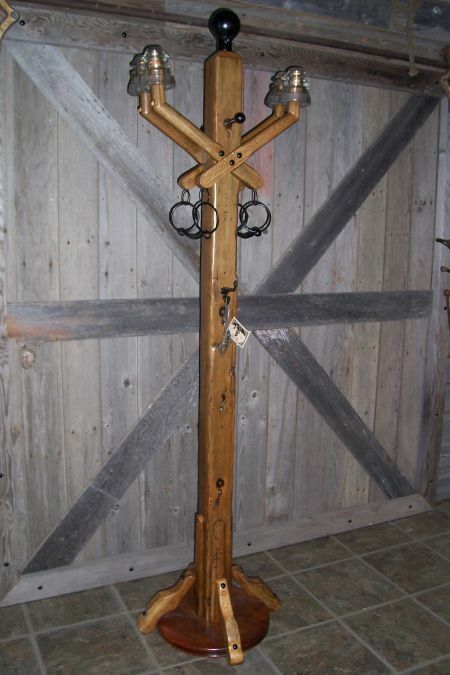 This unique piece started with the pole from an old hay wagon. The coat hanger arms were built from the spokes of an old wagon wheel and are oak. The glass tops are salvaged telegraph wire insulators. Two horse bits are used to hang scarves. The top is a two-piece cast iron ball that I picked up while walking around an old farm site; its origin and function are a mystery. The base is a organ stool seat. 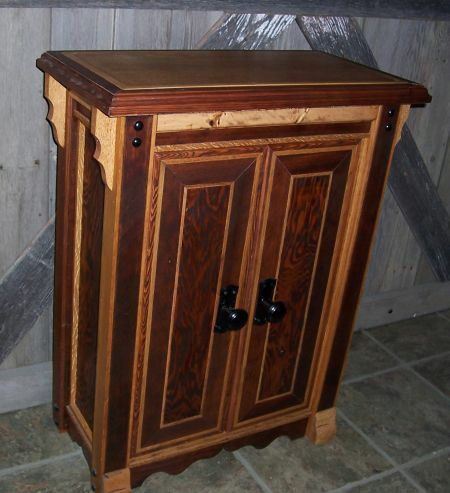 Having been a bow hunter for many years I had always wanted a special cabinet to display my bow. 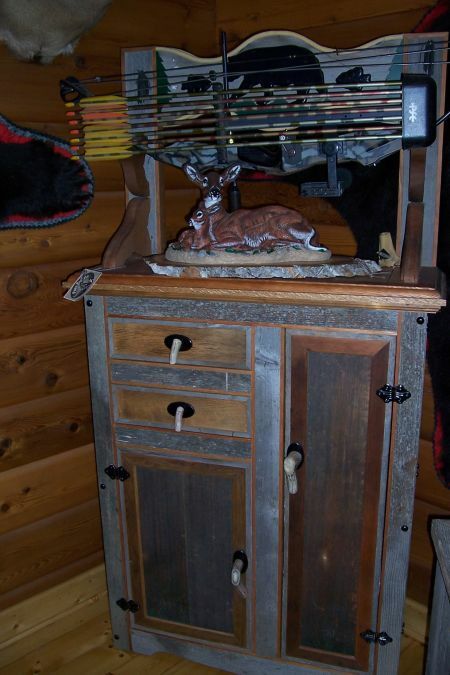 So I designed this cabinet with a bow hunter's requirements in mind. Constructed of weathered fir with complementing golden oak stained fir and maple top. Drawer pulls and door handles are deer antler. Has two compartmented drawers for bow hunting gadgets, broad heads, nocks, etc. Also holds two dozen fletched arrows in an upright position and has an adjustable magazine holder for bow hunting magazines and shelf for camo clothing. Elk hide trim completes the cabinet.